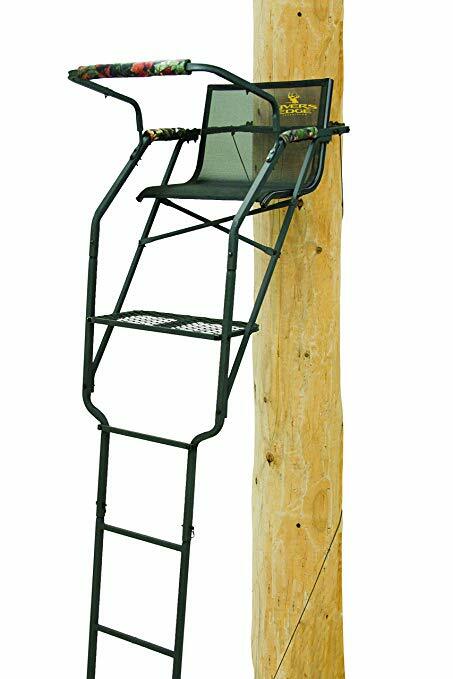 The RE631 by Rivers Edge is a wide ladder stand that you can use on a regular basis without worrying about becoming uncomfortable as you sit in it for several hours at a time. It is made to stand the test of time, providing you with durability, and it has quite a bit of features that are convenient and that make it comfortable. Both the manufacturing brand and those that have already given it a try say that it is stable and secure and that it will definitely impact your hunting performance in a positive manner. Let’s look at some of the potential benefits that this product can offer you. Here’s one area where you needn’t worry about anything since this stand can support your weight and even keep you comfortable as you use it for as many hunting seasons as possible. We know that purchasing a stand can be quite an investment and it’s very likely that you want to use it for as long as possible. Fortunately, with this product you’ll be able to benefit precisely from that since it has been thoroughly tested at the company’s headquarters in Cumberland, WI, before being put on the market. The reliable use you’ll get out of this model will make this item give you the best bang for the buck. One thing you definitely don’t want to worry about when you’re sitting on a tree stand is its stability and capability to keep you safe at all times. After all, you also have to focus on the moves of your target, which means that you are likely to pay less attention to what’s happening with the stand. Having been made from sturdy material, this product can hold your weight securely. It is also outfitted with crossbeams under the seat so as to provide an extra amount of stability. 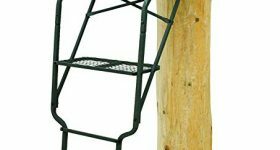 Since this tree stand can hold a weight of 300 pounds, it is not recommended for two hunters, neither is it advised to be used with a lot of gear. We suggest you consider that before hauling all of your equipment. It’s better to be as weight-conscious as possible so as to avoid jeopardizing your own safety. Whenever you are in the market for a ladder stand or a hang-on alternative, you have to analyze the size of all of the parts so as to tell whether it might be a good option for your physical attributes. The height to shooting rail of this one measures 16.8 inches, the height to seat measures 15.2 inches, while that to platform measures 13.8 inches. The size of the platform is 23.5 by 12 inches, the one of the seat is 23 by 14.5 inches, while the ladder stance is 17 inches and the step distance is 14.7 inches. This product weighs in at 54 pounds, so it is considerably lighter compared to some of the others that we have stumbled upon. That makes its installation rather easy. Even though it boasts a rather simplistic design, the Rivers Edge RE631 is outfitted with an ergonomic and comfortable TearMuff mesh seat and backrest that will allow you to sit in the tree stand for a whole day without feeling like you’re not at ease. Something else that we have to note about this choice is that it is equipped with padded armrests, as well as a padded shooting rail. The foot rest isn’t particularly large, so you might not be able to stretch out your legs on it, but you can do so in the air. One inconvenience for some hunters is the fact that this product is not fitted with a flip-up seat, which means that taking your shot while you are standing is going to be a bit cumbersome. However, the seat can be removed as long as you take off the screws. If you want a product that comes with a flip-up seat, you have to look elsewhere because this one doesn’t have it. Another aspect that should concern you when you’re looking for a hunting tree stand is the noise that it makes. With some, the metal parts aren’t welded properly or they don’t have foam in-between so that you can remain inaudible to your prey. Aside from being easy to put together, this particular option is also quiet — at least that’s what we have gathered by going through the feedback provided by other hunters.